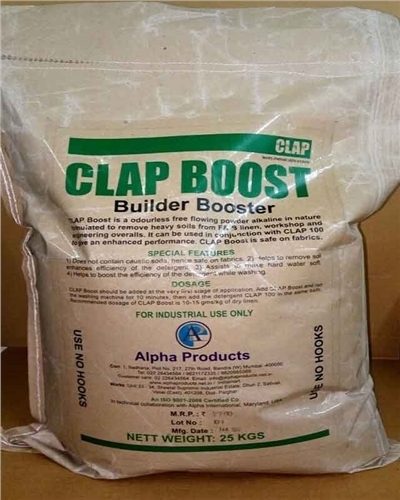 CLAP BOOST is an odourless free flowing powder alkaline in nature formulated to remove heavy soils from F&B linen, workshop and engineering overalls. It can be used in conjunction with CLAP 100 to give an enhanced performance. CLAP BOOST is safe on fabrics. Does not contain caustic soda, hence safe on fabrics. Helps to remove soil, enhances efficiency of the detergent. Assists to make hard water soft. Helps to boost the efficiency of the detergent while washing. CLAP Boost should be added at the very first stage of application. Add CLAP Boost and run the washing machine for 10 minutes, then add the detergent CLAP 100 in the same bath. Recommended dosage of CLAP Boost is 10 -15 gm /kg of dry linen. Store in a dry place. Use a scoop for dispensing CLAP Boost. Close the bag after use In case of contact with eyes, rinse with plenty of water and seek medical advice.